Jake Whyte is a young woman working alone on a sheep farm, keeping to herself, harbouring a secretive past, and feeling terrified all the time. I’m not even sure if she knows what she’s afraid of, besides her past coming back to haunt her, or of getting too close to another human being. But, terrified she is. You can feel the tension in every word of the text. The house was still. Dog stood by the closed door, looking at the space underneath, his hackles up and his legs straight and stiff, his tail rigid, pointing down. And then one creak, on the ceiling, like someone walked there. I held my breath and listened past the blood thumping in my ears. It was quiet and I pulled the covers up under my chin. The sheets chafed loudly against themselves. Dog stayed fixed on the door. A small growl escaped him. I wouldn’t want to be alone in my house while reading this book. I collected all the knives I could find into a roasting tin, and on second thought, the carving fork too, and took them up to bed with me. I turned off the light and pulled a stool to the window and propped the gun up next to it. I sat and waited for my eyes to get used to the dark and I watched the door of the shed with a mug of whisky in my hand. Jake’s sheep are being attacked by someone or something. Then, a strange man shows up on her farm. Who is he and what is he doing there? Where is all her fear coming from? How is she going to learn to move on? It could have been the air, the wind. It could have been that out there in the dark, all of my sheep had turned to stare at me. Or that something pulled itself out of the sea and lumbered up the path towards me. But it wasn’t. It was only the night like I’d seen it a thousand times before, alone. Jake has come to this isolated British island to get away from her past. Alternating with Jake’s present life are flashbacks of her past, starting with her most recent memories, working back until we learn about the shocking events of her earlier life in Australia. I thought I could guess what was coming, but I really could not. 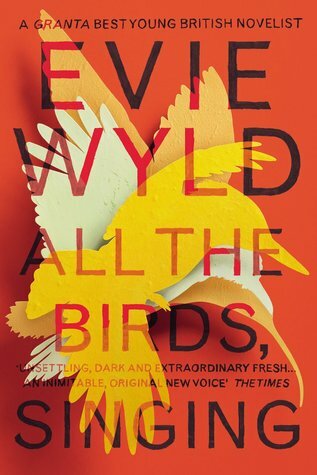 All The Birds, Singing was an engrossing read that I didn’t want to put down. And, the writing is beautiful. I highly recommend it if you are in the mood for something dark and foreboding. 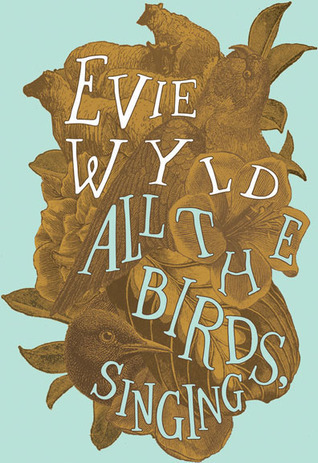 Be sure to read these other reviews of All The Birds, Singing, at Rosemary and Reading Glasses, River City Reading, and Savidge Reads. 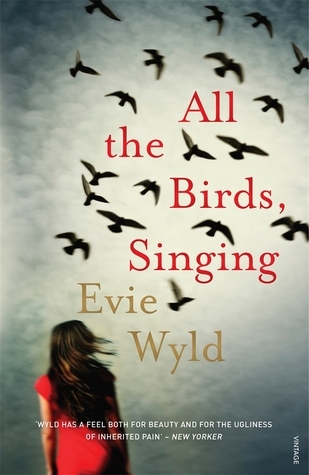 Read more about Evie Wylds and the recognition her books have received at her website. She also runs a small, independent bookstore in London, called Review. This book has so many great covers. Which ones do you like best? With a bird phobia, you should be safe with this book. Maybe avoid it if you are afraid of sheep, or of being scared in general. 🙂 I liked all the covers of this book, which is unusual for me. I had no idea there were so many until I was looking up the images for the review. It is fun to be spooked every once in a while, isn’t it? I do like a scary story once in a while! I actually went through a ghost stories phase for a period of time, and my husband got me a collection of true ghost stories for my birthday. I read it during a long road trip and got so scared by the time we got home that I couldn’t open the book again. Thanks so much for letting me know that I can still read this with a bird phobia. I actually had that question in mind and don’t know why I didn’t ask. Sheep don’t bother me, but now I am nervous about how scared I’m going to get! I didn’t get too scared, just a little creeped out. You know, with the hairs sticking up on the back of my neck at times. I’ve never liked being at home alone at night. My imagination gets the nest of me. 🙂 But, I’m pretty sure you won’t find this book too scary. This sounds like a really great book. I like the first cover best; it looks so sinister! I think you would like this one – and it was quick to read. I think I like the first one best, too. I like the sheep on it. This sounds so great, I need to keep an eye out for it maybe once it’s in paperback! I love the third cover down. It’s best when you’re in the mood for something a bit creepy. I didn’t think it was too scary, though. Just enough for goosebumps. I recently read this and thought it was a great book also. The writing was wonderful and kept me interested for hours. Love all the different covers you’ve included here. I read that the first cover (with the sheep in quadrants and the fox in the middle) was originally with a whole sheep in the middle with a fox on the outer edge. So neat how covers evolve and convey meaning! Yes, I was surprised when I saw all the different covers for this book. In this case, I actually think all of them could fit. I think I like the first one best, though. I’m glad to hear you liked it, too! Loved the writing! I think I like the red cover best, but wow, it’s hard to choose. They all look great! 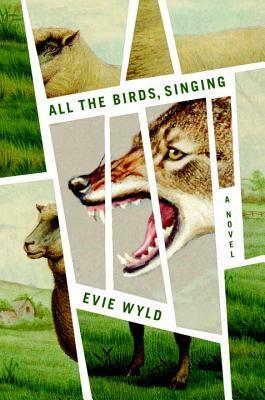 I like them all, too, but I like the sheep and the green on the first cover. All of them fit with the the story, though, which surprised me. I often have strong opinions on which covers are best for books, but not in this case. I’ve added it to my list of books to read. I enjoy how to display different covers. Covers are so important. I prefer the colourful one and the one with the birds in the sky. I’ve had this on my list of must reads for far too long now. Thank you for reminding me about it. I reviewed this one, too! Loved it! That’s right! I remember asking you what you thought of the ending. Add the link to your review, if you want! It’s hard to remember all the reviews I’ve read. The first cover is the one I had from the library, and I think it’s my favourite. It looks a bit more intense than the others. The isolated island is what drew me to this book, too! And, it was worth it! Can’t get over the number of covers some books get. It’s almost as if the publisher couldn’t make up their mind. I was surprised there were already so many covers for such a new book! I don’t know why it happens to some books and not to others. The art department for the publisher just can’t make up its mind.